We often went by coach from Luton to the Locarno on a Saturday night. Easter 1964 we were given a base metal charm of a chicken coming out of an egg as we paid. Mine had a flat base and at the end of the evening I was called up on stage and given a 9 carat gold one in a case. Don’t know if this was a local promotion or if they were given out at all the Mecca dancehalls. Lovely memories. Does anyone remember this promotion? Fanastic place so many great memories from 1969. Used to go there every Saturday night revolving stage Glenn Campbell Rhinestone Cowboy playing. Almost 50 years ago now. Mohair suit, beautiful blond girlfriend now I am old and grey! I remember it well. I started off on Saturday mornings, moved on to the afternoons and then the pinnacle of social aspiration – Saturday nights. How we hated it when the ‘orchestra’ came on! The powder room looks so small!! Monday night was also the Mecca, Friday was ‘Bowes’ then Sunday was a long trip to The Cherry in WGC. I also remember the Monday nights – a lifetime ago! 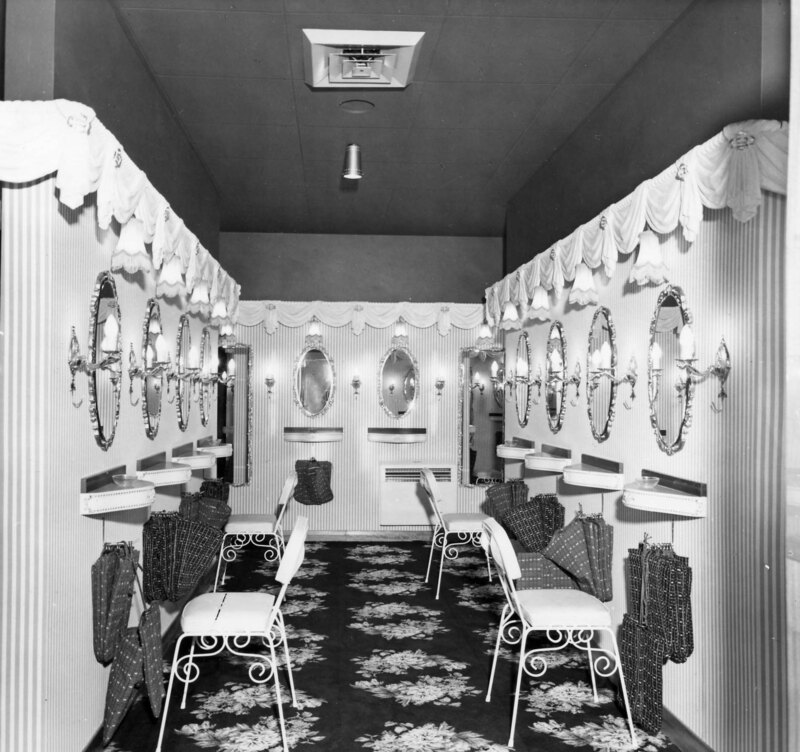 It took me a moment to realize where this was… of course, the powder room of the Locarno Ballroom & Mecca. Loved this place. Monday Night Mecca…Saturday Night and my favourite was Sunday Night at the ???. Saw some great & not so great artists.. Tony Blackburn, Stuart Henry,Johnnie Walker (very fond memories) Go-Go dancing competitions! Broken hearts! The powder room smelling of talcum powder and hairspray and the strobe lights that meant wearing black a disaster… it made everyone look as though they had dandrufff…..
the Mecca…… where I met my first love, Paul Nesbitt, he came over with the Hemel boys…… many a fun night was had there in my youth….. 1967-1971, saw a lot of great bands….. loved the revolving stage and the ‘starry’ ceiling and even though this photo of the ‘powder room’ makes it look like a laundromat we thought it was the coolest place to ever…..